OK, I know it’s way too early to be talking about the fall season, but those who know me will not be surprised that I’ve begun. So with that said, pumpkin season is about three months away so naturally I’m gearing up for it right now. 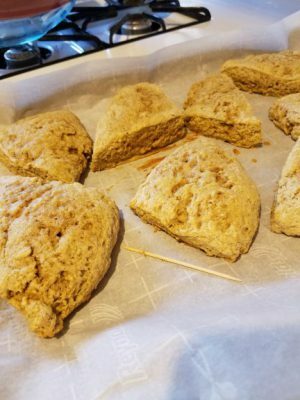 To get you started here’s a pumpkin scone recipe that I picked up from Pinterest. I’ve tried a few different recipes and altered each one a bit to my liking, feel free to do the same. Portion out your pumpkin puree into the sizes you know you’ll need for a specific recipe (we cook and puree our pumpkins each fall so we have a sock pile)! That way you’re not thawing too much at a time, and wasting your precious gold! I also pre-bag my dry ingredients, then write on the bag what’s inside. This way if I get an urge to bake, I’m ready to go. If your dough is too wet, add extra flour. 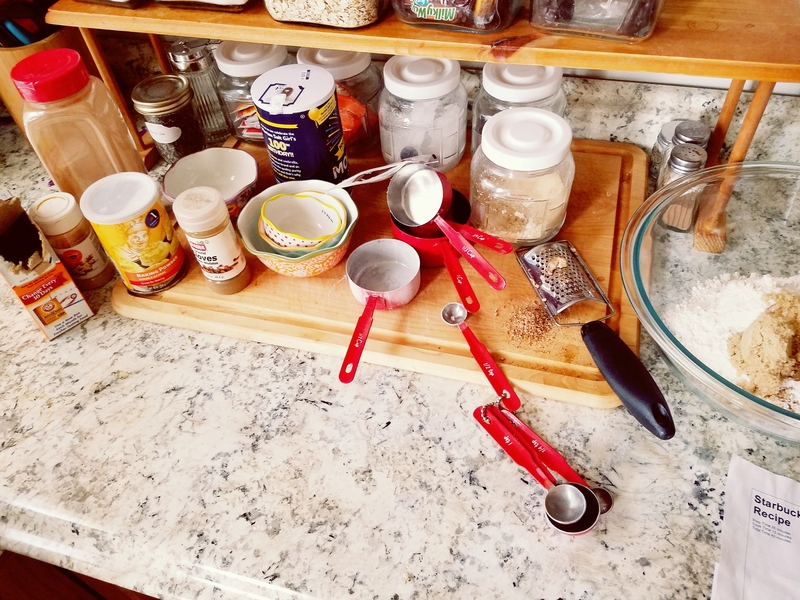 Sift the flour, sugar, baking powder, baking soda, salt, cinnamon, ginger, cloves and nutmeg together in a bowl. Using a food processor I add the cold butter (cut into small cubes first) and some of the dry ingredients (so the butter doesn’t stick to the blades) and pulse a few times until the mixture has pea-sized bits of butter. Then add this to your bowl with the rest of the dry ingredients. *Note-I use a food processor rather than cutting it down and breaking with my hands so the butter doesn’t melt. You can use any method you want. In a separate bowl, whisk the pumpkin puree, egg and vanilla extract until blended. Stir the wet mixture into the flour and butter mixture until a soft dough forms. I use clean hands for this. Move the dough onto your floured board-this is also the step where if your dough is too wet, you’ll need to add more flour…just a little at a time. Once the dough is dry enough to deal with, push it out to about 1/4 to 1/2 inch. I don’t use a rolling pin, or a measurer, I don’t even make sure the shape is specific. I just push and flatten the dough until I feel I can cut 8 pieces. 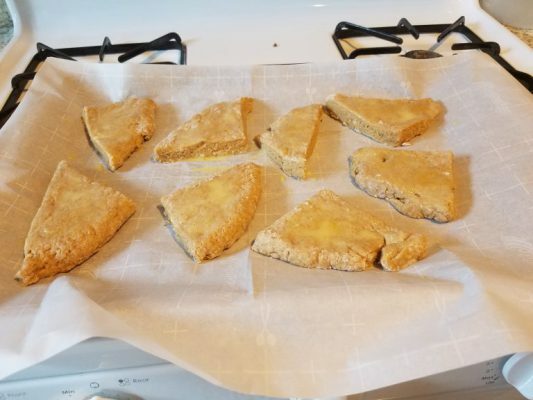 Then give it a brush of egg wash and a sprinkle of white sugar and your ready to transfer the scones to baking sheet lined with parchment paper and bake. Bake at 350 degrees for about 15-20 minutes, or until a toothpick comes out mostly dry. Give the scones some time to cool off, then mix your two glazes in separate bowls. 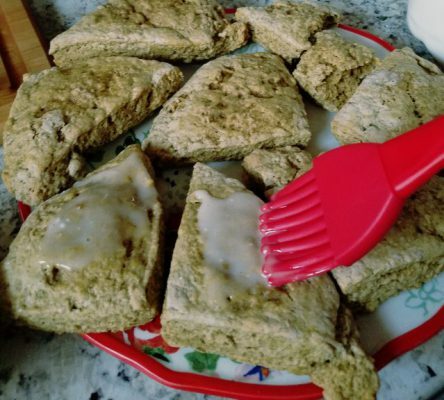 Put the simple glaze on first, covering the surface of the scone. Use a fork, spoon or whatever you tool you may have to drizzle the spiced glaze. ** Let the regular glaze dry before adding the spiced glaze or the two will end up sorta melting together. Does that come with a cup of Seattle best? Mmmmmmm! Of course! Is there any other way? !